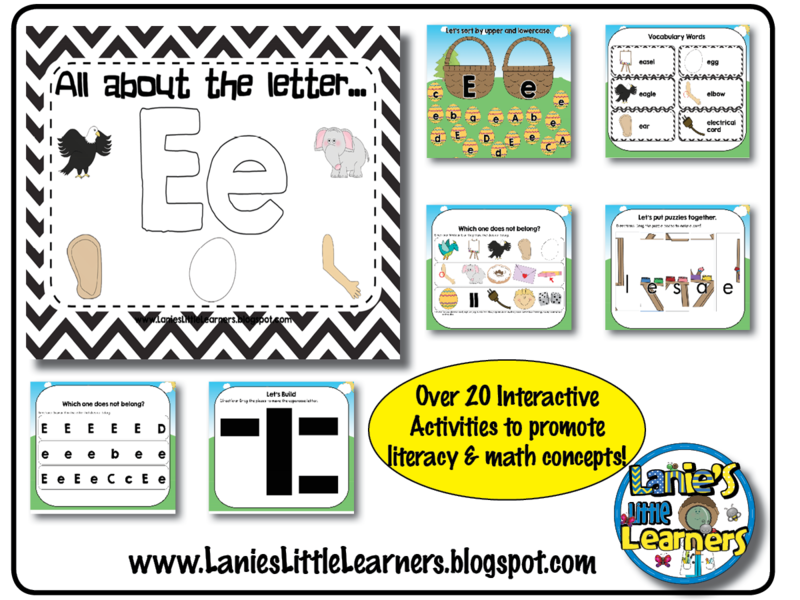 I have put together a collection of songs and read a-loud books about the Letter E.
There are over 20 pages of interactive activities to promote and reinforce letter, critical thinking, and math concepts. All About the Letter E is perfect for whole group, small group, and individual practice on the SMARTBoard or on a computer with the SMARTNotebook software installed. Where is the letter E? Circle the upper and lowercase letter out of a random group of letters. Then count and write how many uppercase and lowercase E’s you found. Where is the letter E? Circle the upper and lowercase letter E’s from the nursery rhyme, “Do Your Ears Hang Low?” Then count and write how many uppercase and lowercase E’s you found. Direct teacher-led instruction on how to write the uppercase and lowercase letter E.
Let’s write the letter E. Individual practice for students. Write the missing letter. Students write the missing letter of words beginning with the letter E.
Help Emily Elephant find her easel. Draw a line from Emily Elephant to her easel by following the path of upper and lowercase letter E’s. What does not belong? Write an E on the letter and or picture that does not belong. Sort uppercase and lowercase letter E. Upper and lowercase letters are printed on Easter Eggs. Drag the Easter eggs into the matching basket. Sort beginning letter /e/ sound. Drag the pictures that begin with the /ĕ/ like in egg and /ē/ like in eagle to the Easter egg. Let’s Play a Game. Word Search. Use the word list. Use a highlight marker and find the letter E words. Word Puzzles. Drag the puzzle pieces around to make words that begin with the letter E.
Let’s Build the Letter. 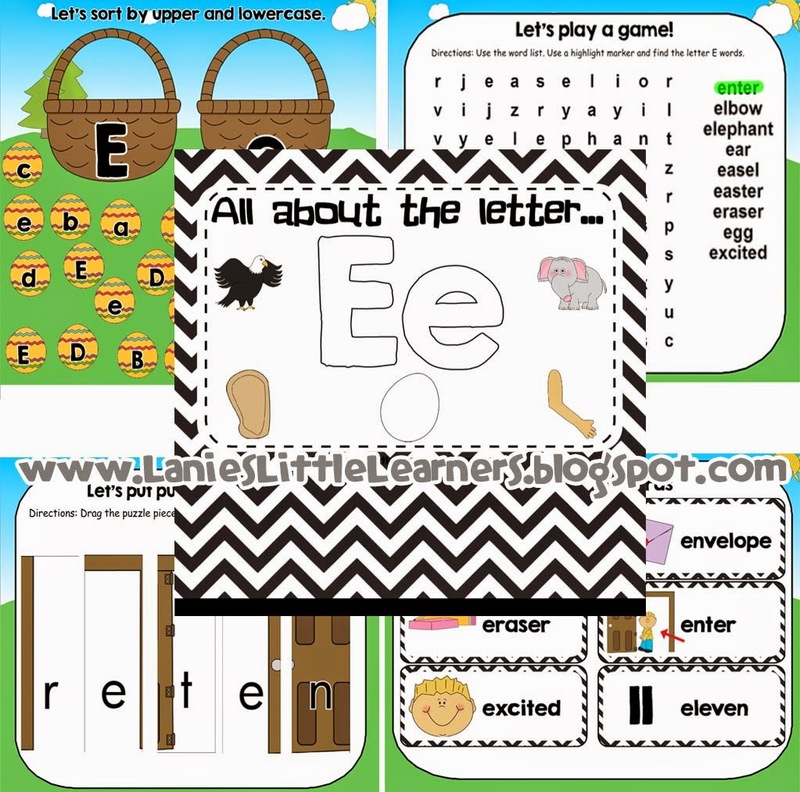 Construct the upper and lowercase letter E out of straight and curvy lines.